looks like it's not working in CAN but I have resistors and capacitors in the right place.. what does it mean..
you should try to remove this two resistors and capacitors. if you plug elm into slot in yours car and can transmision is broken then yours elm makes disturbance. in my elm the main problem were this termination resistors/capacitors. they are needed at the phisical begining and phisical end of can network. it's not good to put additional terminator somewhere in a middle of network as you do with this elm. I believe I have the same problem, when I plug in the interface fitted with the 100ohm and 560pf capacitors it imediatley stops the CAN BUS and sends the instrument panel lights and gauges haywire if I remove the plug it goes back to normal but the odometers flash. When I switch the ignition off and back on the system resets. When I log on to the ABS computer with the Elm interface I get an error code C1522 - ABS to instrument panel data line fault, with the VAG comm lead I get no error code. I am considering buying another interface to try and eliminate the Elm interface from the fault equation. However I am now considering removing these RC networks (100ohm and 560pf capacitors). 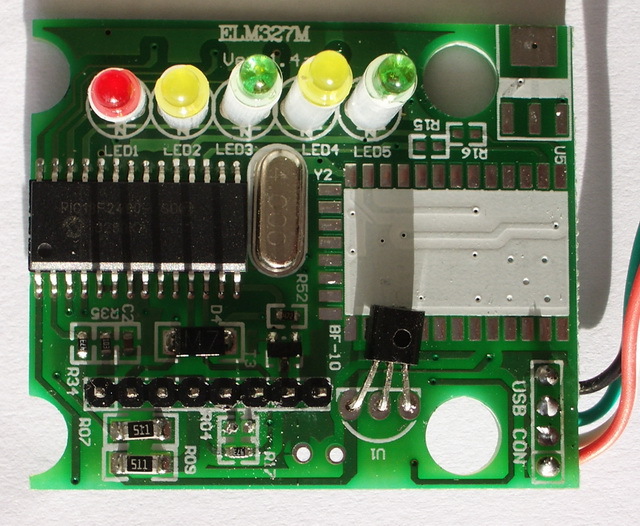 I've got 2 ELM327 interfaces, both labeled as 1.5a, but they differ even in the way they blink the LEDs during the power init procedure. None of them don't want to connect to my Grande Punto when using SCANTOOL.NET (I've set vendor ID to SCNATOOL.NET via terminal AT@3 command). I've borrowed an identical to one of my own interface from a friend of mine and it worked just fine. All interfaces worked fine with ScanMaster-ELM. Unfortunately I had to give it back before the FES v.2.6 was released. None of mine ELMs did connected using 2.6, but both work with 2.6.1?!? I didn't tried it with registered version, but FREE opened a connection, so I assume it will work (hope so, because I've just bought FES). Disassembled and found I had the board below. Using a craft knife I carefully destroyed the 120ohm resistor (R04 on the board). Be careful you don't damage R17 just beneath it. Resembled and it works a treat! My bad interface looks like this. Not sure which version it is. So, do i need to remove R14 and solder 100 ohm resistor and 560pf capacitor like what 1st post did to cure CAN issue? Yes.And then your can line will work. Thanks to all of you for helpful. I bought Bluetooth (BT) ELM 327 from e-bay. It is written that its 1.5 but actually it is 1.4. When I connect it to my car, it works fine with my laptop and android phone. However when I connect it to my N900, it immediately disconnect. libobd[INFO](obdcon_opendev:174): Connected to serial "/dev/rfcomm0"
libobd[ERROR](obdchanelm_error:68): ELM error: "CAN ERROR"
This is the log file in the system of N900 which showed Can error. Now I googled and came across this post. My board was lke Argo board and I followed what he did. I just destroed the capacitor. It still works with Android phone but does not work with N900. sam29 wrote: I just destroed the capacitor. Assuming you only destroyed R04 then I'd go ahead with the full mod suggested by Yani at the start of this thread which involves soldering in a simple RC network. That's the reason I said "quick & dirty"
Thanks Argo for quick reply. Honestly, I understoor your method and original method just flew at the top of my head.